Computer Virus? Malware? We Can Help! At Computer Service, we provide a very popular service called a "PC Health Check". A Health Check is our cleaning your machine up of malware, viruses and spyware for one fixed price. According to pandasecurity.com nearly 20% of computers on the Internet worldwide are actively infected, and all those are running without any form of anti-virus software. Close to half of all online machines (without anti-virus software running) are latently infected - that is to say, at least one file on the machine will, if ran, infect it. If the computer is generating pop-ups or you are sent to websites you didn't ask for, it's usually infected.The most common infections we see include ransomware such as Cryptolocker and its variants, "Optimiser Pro" and the like. A common trend these days with the rise of alternative browsers is to use browser add-ons/extensions that generate the web browser hijacking/pop-ups. The vast majority of these infections used to come from the usage of Peer-2-Peer software, for example BitTorrent and Bitlord. These days the trend is to bundle extra software with your download and hope you don't read what you're clicking on. Other methods of becoming infected are opening email attachments from people you don't know, sharing a pen drive that's been used on an infected machine, opening suspect files and the simple fact that no anti-virus solution is 100% pefect. In this day and age, methods of infection are so sophisicated you do not need to visit a website distributing viruses. If the site you're on calls the website distributing viruses, you get infected without ever visiting it yourself. We offer the Health Check service in two flavours: One is a simple clean-up, the other includes a year's subscription to an Internet Security package, which is a bare minimum requirement for going on today's Internet. The average turn-around time of a Health Check is one working day, however this varies depending on how badly infected the machine is and what other work we have in at the time. You will not lose any data with this option by default, however we do not guarantee customer data. If the machine is too badly infected, we may decide it will be quicker to wipe the machine instead. We will always speak to you personally before we wipe your machine. This option is simply our cleaning up your machine of infections. We have access to many powerful tools, techniques and the knowledge to make this happen. With this option we will also remove any expired anti-virus program that exists on the machine, as it would be of no use to you with today's infections. Note that many common infections (like Torrentlocker/Crypt0L0cker) and its variations encrypt your data files. While we can get rid of the infection itself, it will not unencrypt your files. There is no way at this point in time to get your data back. 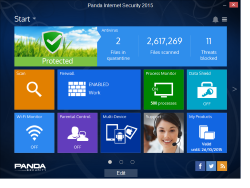 This option cleans up the machine as above, but includes a copy of the latest version of Panda Internet Security, a security suite that lets you use the Internet with complete peace of mind. For over 20 years Panda Security has been innovating and protecting its customers against viruses and other threats. This is fully compatible with Windows 7, 8/8.1 and 10.